The state launched a tax credit ten years ago aimed at helping graduates offset some of the burden of loan payments. Now, some advocates of the program see it as a key part of a strategy to bring more young people into to the state and keep them here. But some lawmakers says the program underutilized and overly complicated. The sun is already close to setting on a recent Thursday evening. But math teacher Kathryn Peppe is still in her classroom at Sanford High School, guiding a student through a packet of problems. "You have ten more of those, and you're done," she tells the student, "And you'll be the first one done with the packet." Peppe's day doesn't end here, though. She works three jobs to pay the bills. Today, she'll leave the high school at 5 p.m. to teach a local adult education class until 9 p.m. On two other days, she drives an hour north to Portland, where she teaches classes at a local community college. The 14-hour shifts often leave her with little time for herself. 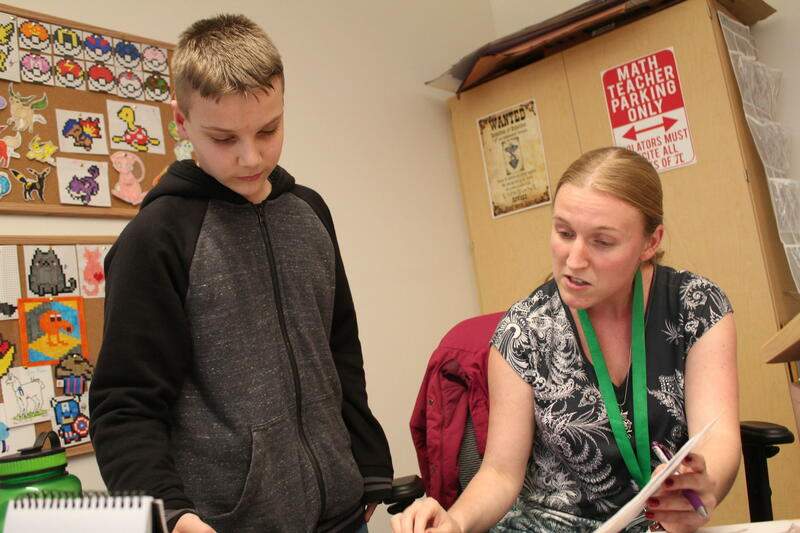 Math teacher Kathryn Peppe works with a student after school at Sanford High School. "I used to love running! But I've had to give it up. And honestly, I haven't run in two months," she says. "Which is horrifying, because it's my stress relief. But I don’t have time to do it. I don't even have time to think. Because when I'm not here, I'm organizing things for all of the classes that I teach." But the extra jobs are necessary, Peppe says, to help pay off the mountains of student loan debt she accrued in college. A little more than a decade ago, Peppe entered the University of Southern Maine, and earned her math degree and teaching certificate in four years. After starting her first teaching job, she earned advanced degrees in special education and literacy. Like most students, she took out loans. She now owes more than $100,000. "Usually, I try not to think about it," Peppe says. "But when I do think about, it's like a hole you can never dig your way out of." Peppe is not alone. The average student loan borrower in Maine left school last year owing more than $30,000. To help alleviate some of that burden, state lawmakers back in 2008 created "Opportunity Maine," a program that would offer a tax credit to Maine residents who graduated from a Maine college during certain years. The tax credit that would cover a portion of their student loan payments, up to around $4,000. Former Democratic State Senator Justin Alfond helped launch the program. "We needed to address college debt," he says. "And we needed to create an incentive for Mainers and those who came into our schools to stay here, and live, work and play." But after it was enacted, it got relatively little attention. By 2011, fewer than 1,000 graduates were using it. Over time, lawmakers gradually expanded it, and two years ago, they opened the tax credit up to any graduate in certain years from any school in the country. Last year, more than 9,000 borrowers received around $17 million off their taxes through the program. Nate Wildes is the engagement director for Live and Work in Maine, which markets Opportunity Maine. He views the credit as a crucial tool to address the state's aging workforce, as well as recent projections of stagnant job growth over the next eight years. 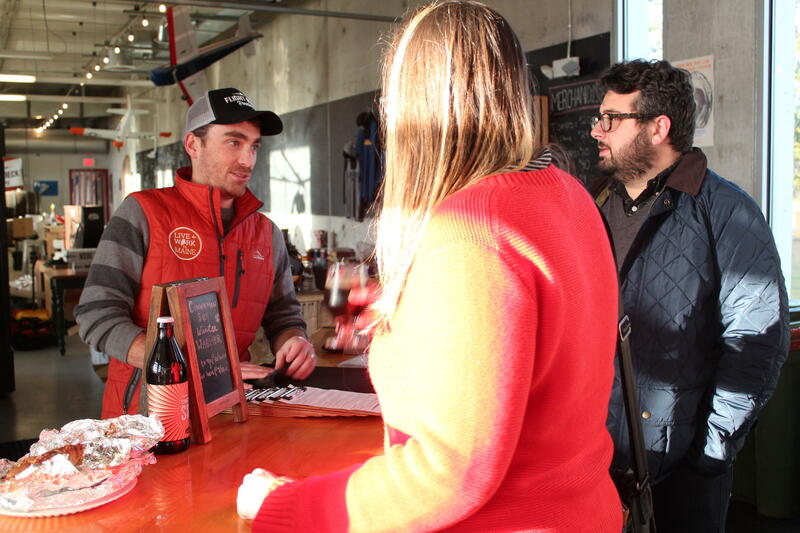 Nate Wildes talks with customers at Flight Deck Brewing in Brunswick. Wildes also works as the engagement director for Live and Work in Maine, which helps promote the Opportunity Maine tax credit. "We're trying to attract tens of thousands of people to stay here full-time," Wildes says. "We annually attract 36 million people to visit us. So on a percentage basis, this is very doable over a decade." But even with its recent growth, some lawmakers say constant tinkering has left the tax credit program complicated and burdensome. If an applicant wants to find out if they're eligible, they need to go to a website and search through a lengthy flow chart. And Democratic State Senator Justin Chenette of Saco says the marketing budget for the program is only $20,000 per year. "We have to do a better job in either simplifying the program or marketing the program to make it easier to understand that, 'Hey, this is how you can take advantage of a student loan reduction program within the state of Maine,'" Chenette says. Democratic Rep. Mattie Daughtry of Brunswick says the state needs to address student debt on the front end, too, by making college more affordable. She also wants to to provide assistance for those who started college and didn't finish, yet still have the debt. Daughtry and other lawmakers hope to revisit Opportunity Maine in the upcoming legislative session. Democratic Governor-Elect Janet Mills has also indicated that she wants to simplify the program. As for whether a tax credit actually can lure more graduates to move to Maine or convince them to stay here, that’s an open question. But, says Wildes, the program is just one piece of a larger package. "You're not going to come here simply because you have student debt," Wildes says. "You're going to come here because you want to make Maine work. You want to live the quality of life that Maine has to offer. And you want to do it in a financially responsible way." For Peppe, her student loan debt is still enormous. She says it actually keeps growing, due to interest. But the tax credit program has helped her cover major expenses. "I mean, my car is a little sad," she says. "So I just had to put $1350 into my car, which did not fix the problem. So I could either fix the problem, or save the money for a new car." In class, Peppe says she tells her students to look carefully at the cost of college. She says she doesn't want them to end up in the same situation. Originally published 4:14 p.m. Nov. 16, 2018.